Robert Thompson, MD gives a revealing testimony about the old-fashioned health strategies that are destroying our bodies. The author states the facts as they stand and opens up about the dangers of excessive calcium levels. 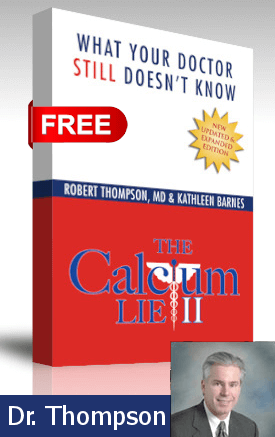 Opting for a comprehensive approach to mineral balancing and health through every stage of life, The Calcium Lie II provides indisputable evidence from an array of trusted sources to disprove previous medical traditions. Read the 233-page book for free and gain a revolutionary approach to full body health through mineral balancing and don’t fall prey to calcium saturation. This book is for sale in paperback and Kindle on Amazon.com & Barnes and Noble. Why Pay for The Calcium Lie II? Get it Free! Why is it most people including doctors think bones are made out of calcium when any basic biochemistry textbook will tell you the truth? Bones are made from over a dozen minerals including calcium and they require a delicate balance of minerals to allow your body to have healthy bones. Dr. Robert Thompson guides you to simple solutions on how mineral imbalances are damaging your health. Dr. Thompson is a board-certified obstetrician and gynecologist currently living in Alaska after receiving his education at the University of Kentucky. Though his practice is more geared towards working with women's issues, he also focuses on nutrition counseling helping many relieve pain from chronic disease, including hypothyroidism, obesity, diabetes and adrenal fatigue. Ms. Barnes has more than 35 years of experience in publishing and broadcast media including 13 books where she is an author, co-author or edited. Currently, she is focused on health and sustainable living for several national media groups.